A flexible, sonically superlative audio interface with comprehensive I/O and a price that can't be argued with. Tried and tested front end Good monitor software/hardware. Slick full rack design. Two headphone outputs. Well priced. No output metering. MixControl could be more flexible. 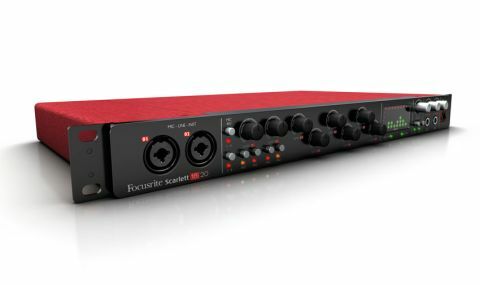 Focusrite's Scarlett audio interfaces are now a well established range, and using the same mic preamp design as the FireWire Saffire range, it's a given that the front end is going to be at least as good as any at this price. "It may not appear to be a big step up from the 18i6, but they're worlds apart in terms of physical connectivity"
The 18i20 has 18 inputs and 20 outputs, and is effectively a Saffire Pro 40 with USB 2.0 rather than FireWire (though there are a few notable differences, such as word clock only being on the 18i20 and no optical S/PDIF option for the 18i20). Although it may not appear to be a big step up from the Scarlett 18i6, they're worlds apart in terms of physical connectivity. Two front-mounted mic/line/instrument inputs are joined by six rear-mounted mic/line inputs (all on combo connectors). All eight mic preamps feature individual front panel gain knobs, along with 48V phantom power switched on/off in two banks of four. Inputs 1 and 2 get manual switchover for high impedance instrument input and a 10dB pad switch. There are ten analogue outputs on balanced TRS jacks, the first two of which are labelled 'Monitor'. The front panel also has two dedicated headphone outputs with individual level controls. The other ten inputs and outputs are digital, with stereo S/PDIF via RCA and eight further channels on ADAT lightpipe. The latter can also handle S/PDIF or four channels of SMUX at 96kHz. Lastly, there's MIDI In/Out, word clock out and a mains input socket. The 18i20 can also run as a signal mixer in standalone mode. Display-wise, the front panel hosts eight 5-part LED input meters as well as USB Active and clock Locked indicators. There's also a monitor level control with Mute and Dim buttons. The 18i20 uses Focusrite's Scarlett MixControl software, so although input gains are hardware-controlled, the monitor, Dim and Mute controls can be accessed via software, too. Finally, the 18i20 comes with Focusrite's Scarlett Plugin Suite (EQ, Compressor, Reverb and Gate), 1GB of Loopmasters samples, Ableton Live Lite, and Novation's Bass Station soft synth. "Like many current audio interfaces, the 18i20 tackles the 'studio hub' role successfully"
At 3kg, the 18i20 is a hefty unit, and although the Scarlett series' red livery has been carried through to the case, the black front panel is a far more serious and professional-looking affair. It all feels very solid, and while we prefer the rubberised black mic preamp knobs to the shiny silver monitor and headphone knobs, that's obviously not a deal breaker. Like many current audio interfaces, the 18i20 tackles the 'studio hub' role successfully, bringing together input, output, software monitoring and hardware monitoring. Having two separately configurable headphone feeds, for example, is very useful, as are the physical Mute and Dim buttons and additional software monitoring options (including mono). The combo inputs automatically switch between mic and line sources based on plug type, and the 60dB of gain handles low-level signals well. The input LEDs do the job, although there's no option to switch them to output monitoring. One minor issue: in some circumstances, the monitor mute and level can be a bit slow to respond. Focusrite say it's a software problem that'll be fixed soon in an update. In use, MixControl delivers the near zero-latency monitoring you need when recording without a hardware desk, and non-destructive solo (PFL) is a useful inclusion. The mix software, however, isn't as fancy as equivalents from the likes of MOTU and Metric Halo. Notwithstanding, the 18i20 is competitively priced for a unit that delivers such excellent results.